A collection that celebrates the Jazz Modernists from l924-33. Music from a time when a new intellectual generation introduced new influences into jazz. • With compositions by Fud Livingston, Arthur Schutt, Frank Signorelli, Hoagy Carmichael etc. For most general jazzlovers the term ‘modern jazz’ is retrospectively defined – however obstinately or anachronistically - by the postwar revolutions of Charlie Parker, Dizzy Gillespie and Thelonius Monk; all of them more than sixty years old now. 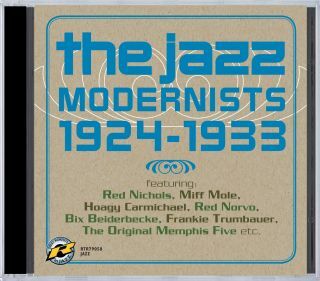 So how can there be a collection such as this which delves back yet another twenty years in order to (gloriously) celebrate ‘the Jazz Modernists l924-33’? Well, if we know that on February 26th l917 the first cacophonous jazz recording - ‘Livery Stable Blues’ and ‘Dixie Jass Band One-Step’ by the Original Dixieland Jazz Band - burst unrepentantly on the public ear, it follows that not only had a new and virile artform launched itself on the world, but that its refinement by a new intellectual generation was both urgent, inevitable and musically seductive too. So that by June l924 Paul Whiteman – an historic champion of Beiderbecke and his contemporaries - had already presented his groundbreaking “Experiment in Modern Music” concert at Aeolian Hall New York; a broad reflection of what was around in American music of the period, including not only jazz sweet and hot, but what might be (gratuitously) called ‘light music’ as well as the premiere of George Gershwin’s ‘Rhapsody in Blue’. And it’s no surprise, therefore, that, at the same time, American jazzmen were drawing on the same contemporary influences to enrich and enlarge their own artistic outputs. Classical music seemed to have been closer to jazz at this point that its longhair afficionadoes might have been prepared to admit. “But” said Paul Whiteman “ – you’ll never learn to bounce in jazz if you don’t know your Bach and your Beethoven!” And even if it was Ravel, Delius and Debussy who were the men of the day, they certainly provided some of the incidental inspirational sources which l920s jazz musicians brought to their creations. And this was inevitable. Because ten years previously the music of which they would subsequently be historic pioneers had yet to furnish viable artistic premises by existing on record at all! Throughout the l920s, an alternative movement was in the midst of leaving a rich legacy to the music’s history. 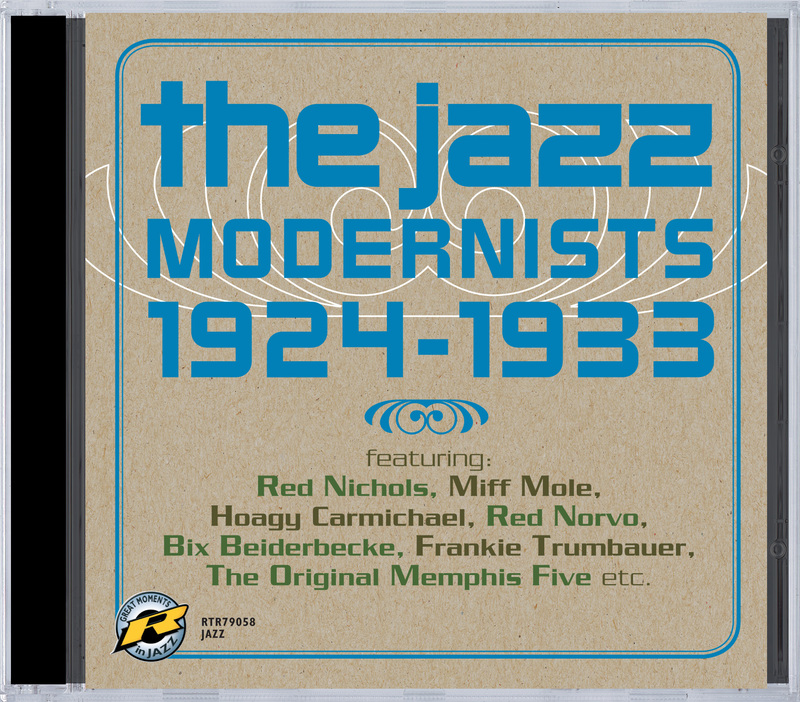 And its creators were indeed ‘The Jazz Modernists’ l924-33’. Unquestionably their central figure was cornettist/pianist Beiderbecke, whose work – like that of his (much misjudged) counterpart Red Nichols – is generously represented in this collection. Generally the composers of pieces used by jazzmen are, with a few exceptions, regarded as comparitively unimportant, functioning only as providers of a basic framework on which the jazz musician may hang his improvisations. Most of the pieces on this CD are considerably more complicated than the average, and the majority of their “modern” effects are written parts of the composition, nonetheless structured in such a way as to leave some space for the intrepid improvisor to exercise his skills. Fud Livingstone is not a household name but he certainly deserves to be better known. A fine clarinettist in the Pee Wee Russell mode, he was also an adventurous arranger. Richard M. Sudhalter in his classics book “Lost Chords” cites his “Feelin’ No Pain” as displaying “a touch of Klangfarbenmelodie; that device beloved of followers of twelve-tone European music ... the result is a “melody” constructed as much of tones and textures as of pitches”. Livingstone’s “Imagination” also more than lives up to its title. Pianist Arthur Schutt’s “Delirium” is only one of a number of modernistic pieces that he composed. The Original Memphis Five are often dismissed as mere followers of the Original Dixieland Jazz Band playing a watered down version of their style, but “Meanest Blues”, a piece written jointly by trumpeter Phil Napoleon and pianist Frank Signorelli is very forward looking for its early date and they do an excellent job on “The Chant”, written by former New Orleans Rhythm Kings pianist Mel Stitzel as a study in shifting tone centres. Signorelli later wrote such standard numbers as “I’ll Never Be The Same” and “A Blue Serenade”. Another fine pianist was Rube Bloom, writer of the seductive “Soliloquoy” and hero of hundreds of recording sessions. He went on to write such great songs as “Don’t Worry’Bout Me” and “Give Me The Simple Life”. Of Frankie Trumbauer we will have more to say later in this note, but it is worth mentioning at this point that “For No Reason At All in C”, in which he certainly had a major hand, is actually a popular song of the day entitled “I’d Climb The Highest Mountain”, with the melody removed, much as the be-bop musicians were to do some 20 years later. Interesting also in that “Highest Mountain” is in itself based on a classical work, “Humoresque” by Antonin Dvorak. The CD ends with two titles by vibraharpist Red Norvo that first pay tribute to Bix with a faithfully re-interpreted presentation of his most famous piece of piano impressionism ‘In a mist’, then move on and out to ‘Dance of the Octopus’ which descends at its opening into almost eerie and completely atonal impressionism. Perhaps, for the hep-cats of the l930s, such abstract exercises were no longer something fitting for cutting a rug on the dance-room floor. But no track could more appropriately furnish a coda for the explorations of the exclusive salon of premier craftsmen who formed the Jazz Modernists 1924-1933.